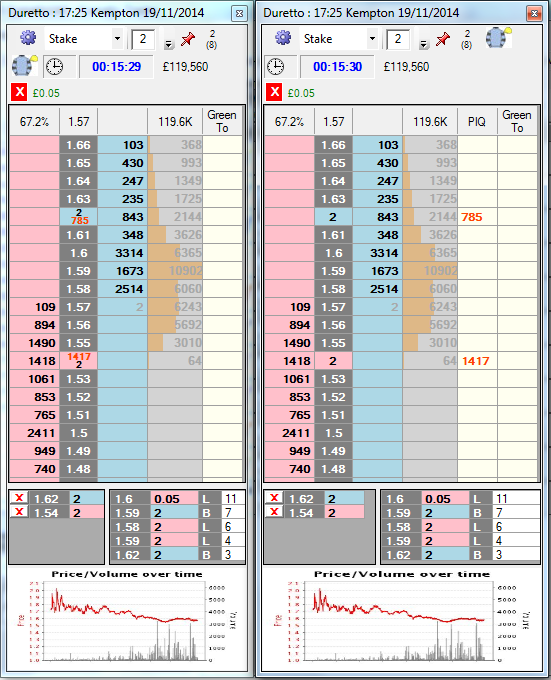 When there are multiple unmatched bets at the same price, the exchange holds all those bets in a queue. The bets at the front of the queue will get matched first with any suitable incoming orders. In other words, the bets that arrived first are at the front of the queue ('First In, First Out'). The PIQ of your unmatched bet is displayed as a number representing how close your bet is to being at the front of the order book queue to get matched (1 representing the front of the queue). So observing your PIQ helps you know how close your bets are to being matched. This is extremely useful information when you are trading, which can involves constantly trying to judge whether to cancel an unmatched bet or leave it to get matched, based on whether it has a favourable queue position and whether the weight of money in the market is likely to help to support your position if your bet gets matched. PIQ is visible in a column on the ladder interface. PIQ works for all orders, so long as the market is open anywhere in Cymatic (or has been chosen to be a 'managed' market). So it can even work for orders placed on the Betfair website or via another software application! If you have turned off the full depth of market (File | Settings menu, then untick 'complete prices' in the API Refresh tab), then PIQ will not operate. If there is £100 available to back at a price of 5.00, you then add an order to lay £10 at 5.00 (so the market now shows £110 instead available). Now you will see 101 as your PIQ, meaning that your money starts at position 101 in the queue. If other people are trading and match £50 at 5.00 then you will see your PIQ number reduce from 101 to 51, as you get nearer to the front of the queue and your chances of getting matched increase. If that price continues to trade then eventually your order will get to nearer to queue position 1 and then hopefully get matched! Select this option in the ladder menu to display the PIQ in the price column on the price row corresponding to the bet. If you are also displaying your bets in the price column, then both items will be visible in one cell. The font will be smaller ensuring that they both fit. The PIQ number is the one that appears closest to the front of the market and will be coloured differently so that you recognise it.